Sweet Floweret: Why is Good Friday called Good Friday? I did a quick search on this question. It was asked during our Good Friday service. At first, my search came up empty. Really, there was no one who could provide a historical reason as to why this day is called "Good". Then I stumbled upon this site. It's a blog entry by a pastor in CA named David Tieche. I'd never heard of him before, but, I REALLY liked what he had to say. Please, please read the Psalm below. 19But you, O LORD,do not be far off! "One thousand years before Jesus was even born, God the Father and the Holy Spirit and David wrote Jesus a song. First, the song that would detail Jesus’ suffering. The song – which was written by his Father for Jesus was describing precisely what Jesus was actually seeing. Jesus would know that His Father saw everything that was happening to him. Jesus would know his Father understood what was happening. God the Father got it. He knew what Jesus was not only seeing, but experiencing. He’d written a song about it. But the song didn’t stop there. Psalm 22 is a victorious song. A song of triumph. A song of hope. It’s a song about how God will do something wonderful, and that generations to come – people who aren’t even born yet – will tell stories about this wonderful thing. It’s said that Jesus had you and I in mind on that cross, and this is proof. God the Father wrote his boy a song of comfort. And in his darkest hour, delirious from pain, wracked by fear and anxiety, Jesus sang the words of the song written by His Father for him. Specifically for him. Only for him. A song of comfort. A song of promise. A song of hope. And that is why Good Friday is good." If you have a few more minutes to read his whole post, here's the link. Love it, Tina! I was asked this question last night and afraid my answer was not nearly as good. Thanks for posting this! Thank you for sharing this. 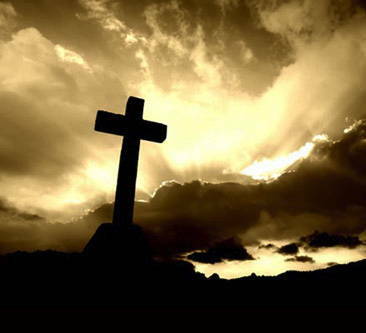 Happy Good Friday, and a blessed easter to you and your famiy. P.S. Sorry, meant to capitalize Easter. Typo!